A gentle flutter of confetti over a newly married couple is a long tradition most couples choose to have on their wedding day. Of course, the best confetti for both photos and the environment is natural petal confetti. You only get one chance to capture the confetti moment, so how do you ensure it’s as magical as you’ve always dreamed of? 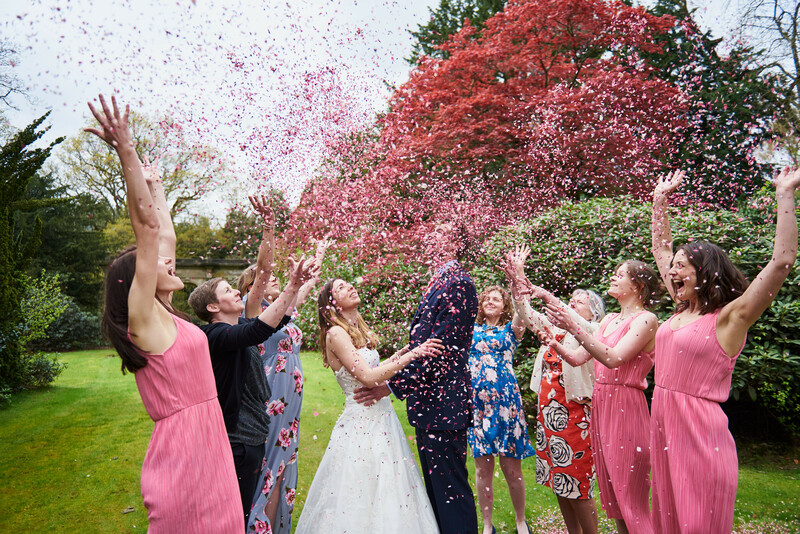 Natural Petal Confetti growers, Shropshire Petals share their 5 top tips on how you can get a magical confetti photo to cherish forever. 1. Discuss your confetti photo with your photographer – Ask to see examples of confetti photos your photographer has already taken to give you an idea of their style. They will be able to discuss options with you such as location, lighting and the surroundings, which will all help when it comes to choosing your confetti colours. 2. Choose the best petals for throwing – The best petals for throwing are small petals such as delphinium or wild flower petals as they are light, which means they fall delicately and slowly. Opting for smaller petals rather than large ones such as roses or hydrangeas will ensure your photographer has plenty of time to capture the magical moment. However, if you are set on a colour only available in larger petals, you can add these to your chosen smaller petals to give a colourful, textured effect to your photos. 3. Select the right colours for your venue – this might sound simple, but you will need to consider where your confetti moment will take place – is the background light or dark? Select colours that stand out with your background, so light or brighter petals for dark backgrounds such as under trees and against brick walls, and darker or mixed colours if your photo is to be taken in an open area to ensure they stand out beautifully. 4. Calculate how much you will need – as a guide, usually about half of your guests will throw confetti. However, depending on the type of shot you want – a photo full of petals or a light shower – you will need to know how much to order. Shropshire Petals recommend that 1 litre of delphinium & wildflower petals will be enough for approx. 10 handfuls. However, if you want a fuller confetti shot, make sure you have plenty for your guests to throw. You can use the confetti calculator on the website to help. 5. Make sure your guests know how to throw! Everyone knows how to throw don’t they? Remember, you only get one chance (unless you have ordered more than enough for a few shots) to capture your confetti moment and the key in a perfect confetti photo is in the throwing. Delegate a member of the bridal party to organise the shot by getting asking guests to stand close to each other and throw as high as they can, which will create a lovely flutter – you don’t want confetti thrown directly in your faces! Tip! If you want a confetti photo taken from above, ask your photographer to take it standing on a ladder or on a balcony above you, for a contemporary confetti photo with an interesting angle. And it’s as simple as that! Remember to relax and enjoy your perfect moment and cherish the confetti shot forever. Keep up-to-date with news, offers, competitions and more by following Shropshire Petals on Facebook, Twitter, Instagram and Pinterest. For inspiration and ideas, visit www.shropshirepetals.com.